“As you continue on your spiritual path you begin to lift in vibration and frequency and you continue to experience new levels of love and light. Your energy body undergoes an essential transformation. These changes in the energy body require that past pain, and limiting views of self be released. When this happens and the pain comes to the forefront of your experience, it can definitely feel like you are taking quite a battering! Ask Ganesha to surround you with his beautiful energy at this time. You may envision this energy as red, yellow or white in colour, or in any colour that resonates with you. Imagine this energy is filled with love and light. It is said that Ganesha oversees the angels of protection. 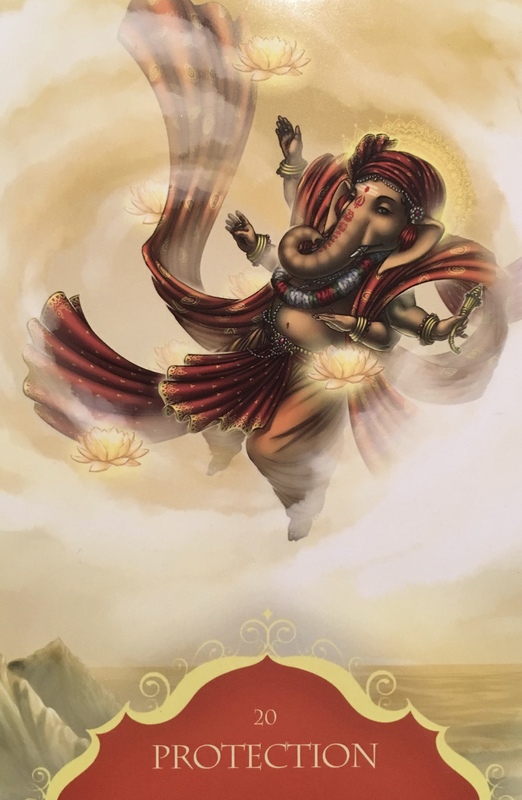 Ganesha’s light energy serves to release any negative energy within its field into light. Visualize negative energy, entities, memories or stuck energy being released from your spirit, mind and body. There is so much going on in the world right now… chaos and upheaval, fear and hatred, terrorism and war… and we are all affected by it, even if it is not happening in our own back yards. We are being lead to believe that we are not powerful. We are being told that we need to stay safe, hide away and obey the powers that be. We can take on the collective consciousness, the mass hysteria… or we can protect ourselves and our energy and continue to do what we came here to do. We are so much more powerful than we are lead to believe. And we are starting to exercise some of that power, and it is making those in a position of power very uncomfortable. We need to stand up for what we believe in. We need to protect what we hold dear. And we must link arms and rise up to protect our Great Mother… before it is too late. Do not let the fear hold you back. Encircle yourself in bright white light, every morning before you even get out of bed, and strengthen it again as you get into bed. Create a powerful shield around you that is impenetrable by all energies but that of Love. This will give you freedom from the chaos. It will give you clarity, it will give you strength, and the courage you need to step into your power. Do not underestimate the power of Good that we have at our disposal. Call in all of your benevolent beings of Light to assist you in shielding yourself. Know that you are protected. Know that you are here to heal. And know that you are unstoppable, especially when we All come together.